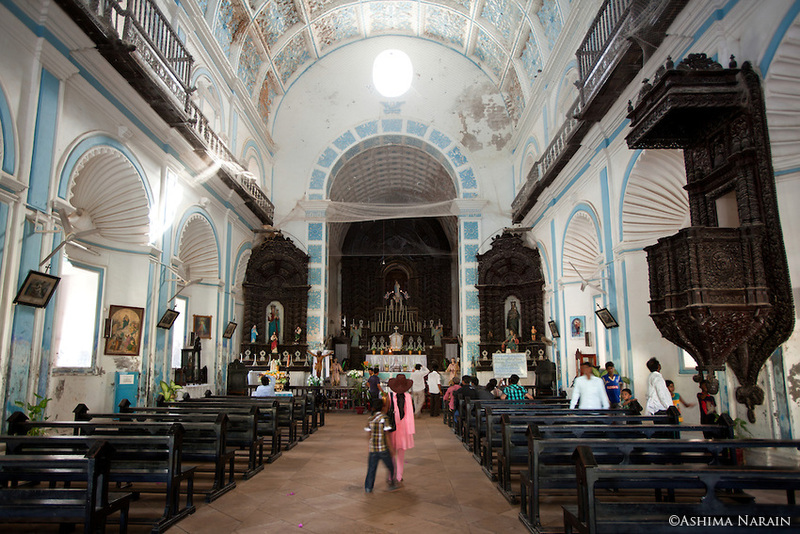 During the Portuguese colonial rule, a number of beautifully designed churches came up in their settlement(s). 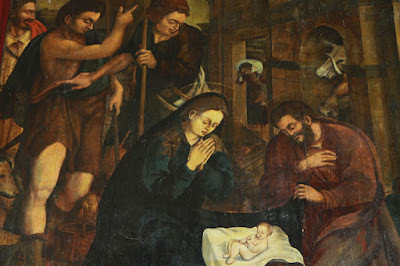 The Portuguese, the later colonists British, French and Dutch, landed in India not only to to explore their mercantile trade prospects, but also to introduce Christianity among the natives. Hence, they began building many churches and brought in a lot of preachers, in particular Jesuits from Portugal. In the Diu island on the west coast of India, there existed three churches that had been built after the island was taken over by the Portuguese in the 16th century. 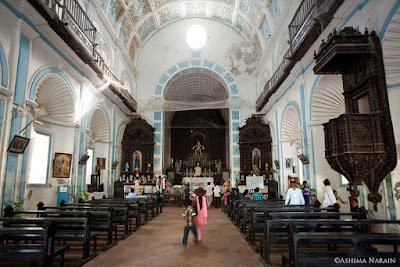 St. Paul’s Church, named after St. Paul, the Apostle of Jesus, is a popular one and it s the island's last remaining fully-functional church. 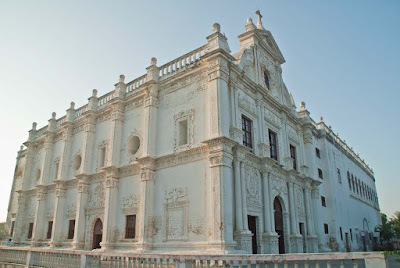 The Church of St. Francis of Assisi, the first church built in Diu in 1593, is now used as a hospital and the other one St. Thomas Church is converted into a museum. Famous for its unique Baroque - Gothic architecture, it was completed in 1610 AD; work began in 1601. 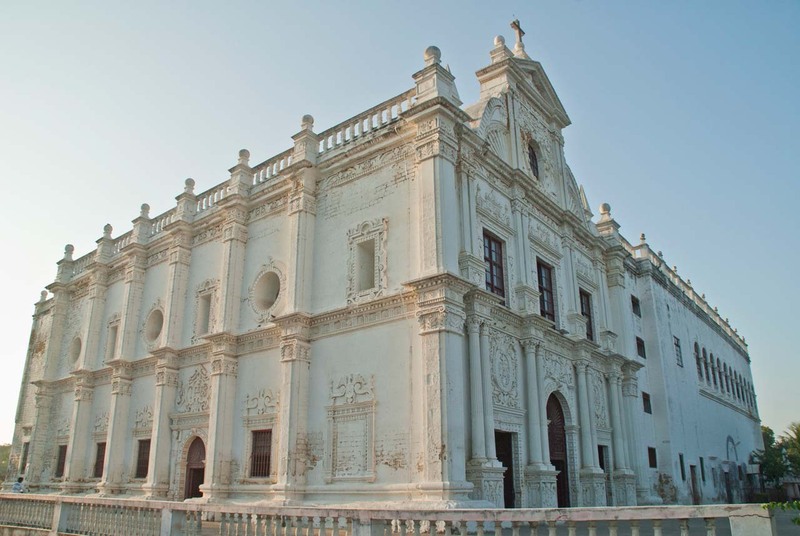 Diu that has a chequered history remained in the possession of the Portuguese from 1535 until 1961 when the Indian Union took over the island. 01. Dedicated to Our Lady of Immaculate Conception this church is the largest one on the island. 02. The interior of the church has a well decorated wooden paneling and furniture made from quality wood, including lavishly carved 400 year old impressive pulpit. 03. Its eye-catching volutes and shell like motifs are inspiring. 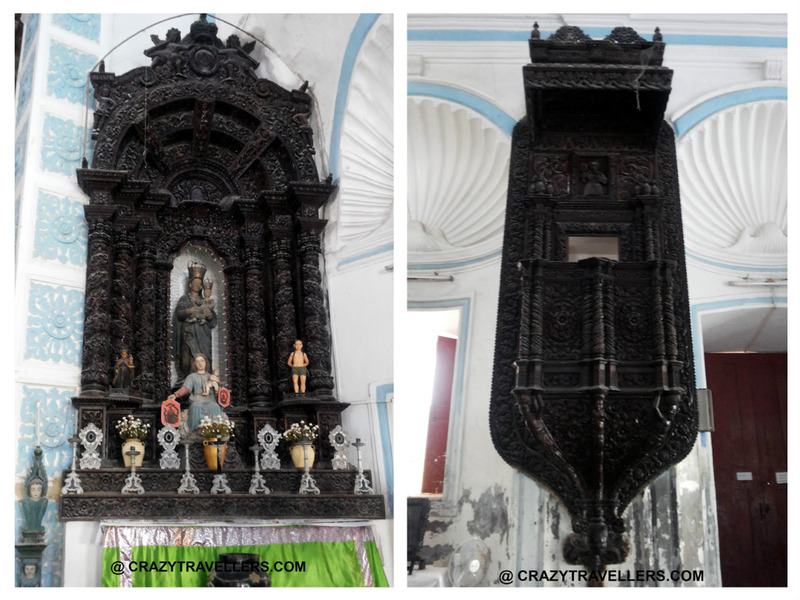 Besides, the fascinating and delicate wood carving makes it the most elaborate and distinct among all the Portuguese churches in India. 04. Yet another feature is the detailed front elevation that adds zest to its appearance. 05. 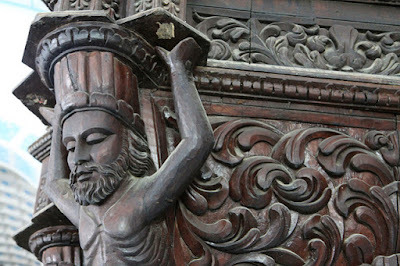 In many churches the statue is made of marble or any other hard stone. 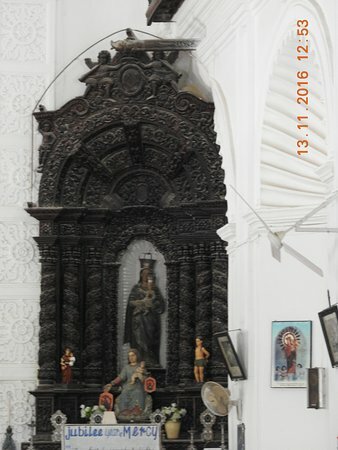 Here, the mesmerizing statue of compassionate Mary in the altar is made from a single log of Burmese teak wood that is lined and lit up with 101 candles, an amazing piece of wood work that may baffle our imagination. 06. 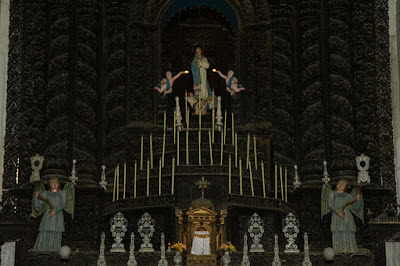 Above the altar are found Priceless old paintings and nice statues thatenhance the divinity of this place of veneration. 08. 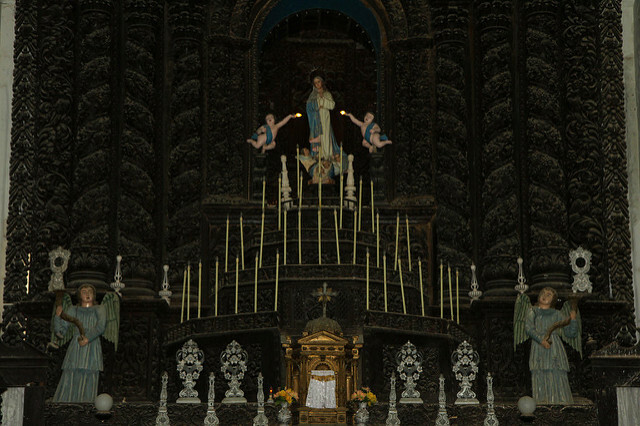 A distinct feature of this church is the religious images made in ivory and the objects made in silver have strong local influence in this Jesuit Church. 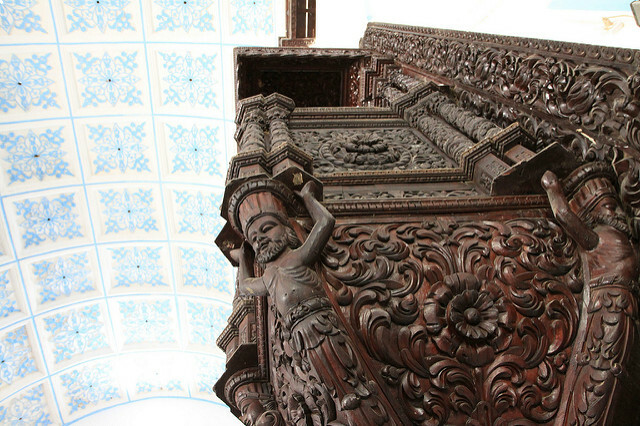 The reason attributed to it is the highly skilled native artists / artisans were not trained to recreate the original Jesuit architectural designs. Such work needs special training, besides knowledge of the religion. Religious images made from ivory or metals are rare in many churches. 09. The Feast of the Eleven Thousand Virgins to mark the commencement of the school year and the other one on 25 January to mark the conversion of St. Paul are the two important religious events associated with this church and lots of Christian attend these joyous events. These events have been observed for centuries. 10. Singing in the church was not an accepted practice among the Jesuits who came to India in the early days, however, over a period of time, it became part of important ceremonies.